Classification and relationships after Ehrmann (2002), Grimaldi (2003) and Svenson and Whiting (2004). See the Discussion of Phylogenetic Relationships below. About 2300 described species in about 430 genera. Ehrmann (2002) revised the classification of Mantodea, recognizing several new families and subfamilies, and many new genera. Svenson and Whiting's (2004) molecular phylogenetic analysis revealed the paraphyly of several of these families, subfamilies, and genera. Balderson, J. 1984. Catalogue of Australian Mantodea. CSIRO Technical Paper No. 23. Balderson, J. and K. H. L. Key. 1991. Mantodea (Praying mantids). Pages 348-356 in Insects of Australia: A Textbook for Students and Research Workers. Volume I. Second Edition. I. D. Naumann, P. B. Carne, J. F. Lawrence, E. S. Nielsen, J. P. Spradberry, R. W. Taylor, M. J. Whitten and M. J. Littlejohn eds. Carlton, Victoria, Melbourne University Press. Beier, M. 1964. Blattopteroidea Mantodea. Pages 829-970 in Bronn's Klassen und Ordnungen des Tierreichs 5. Beier, M. 1968. 12. 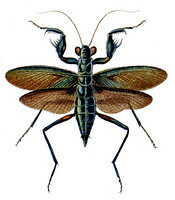 Ordnung Mantodea (Fangheuschrecken). Pages 1-47 in Handbuch der Zoologie 4(2) 2/12. J.-G. Helmcke, D. Starck, and H. Wermuth, eds. de Gruyter, Berlin. Béthoux, O. and F. Wieland. 2009. Evidence for Carboniferous origin of the order Mantodea (Insecta: Dictyoptera) gained from forewing morphology. Zoological Journal of the Linnean Society 156(1):79-113. Kaltenback, A. P. 1996. Unterlagen für eine Monographie der Mantodea des südlichen Afrika: 1. Artenbestand, geographische Verbreitung und Ausbreitungsgrenzen (Insecta: Mantodea). Annalen des Naturhistorischen Museums in Wien 98B:193-346. Kaltenback, A. P. 1998. Unterlagen fur eine Monographie der Mantodea (Insecta) des südlichen Afrika: 2. Bestimmungstabellen für die höheren Taxa, Nachträge zum Artenbestand. Annalen des Naturhistorischen Museums in Wien 100B:19-59. Klass, K. D. 1997. The external male genitalia and the phylogeny of Blattaria and Mantodea. Bonner zoologische Monographien 42:1-341. Lombardo, F. 1997. New and little known Mantodea from eastern and central southern Africa. Journal of Orthoptera Research 6:69-81. Lombardo, F. and B. Agabiti. 2001. The mantids from Ecuador, with some biogeographic considerations. Journal of Orthoptera Research 10(1):89-104. Maes, J.-M. and R. Roy. 1999. Orden Mantodea. In Maes, J.-M., Insectos de Nicaragua vol. I., Setab, Bosawas, Marena, Managna: 60-63, 2 fig. Marshall, J. A. 1975. A catalogue of the primary types of Mantodea (Dictyoptera) in the British Museum (Natural History). Bulletin of the British Museum (Natural History). Entomology, 31 (8):309-329. Preston-Mafham, K. 1990. Grasshoppers and Mantids of the World. Blandford, London. 192 pp. Prete, F. R., H. Wells, P. H. Wells, and L. E. Hurd, eds. 1999. The Praying Mantids. Johns Hopkins University Press, Baltimore, London. Ramsey, G. W. 1990. Mantodea (Insecta): with a review of aspects of functional morphology and biology. Fauna of New Zealand 19:1-96. Roy, R. 1987. General observations on the systematics of Mantodea. Pages 483-488 in Evolutionary Biology of Orthopteroid Insect. B. Baccetti), ed. Halsted Press (John Wiley & Sons), New York. Terra, P. S. 1995. 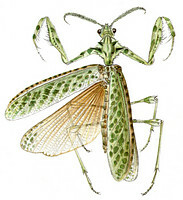 Revisao sistematica dos generos de louva-a-deus da regiao Neotropical (Mantodea). [Systematics of the Neotropical genera of praying mantis (Mantodea).] Revista Brasileira de Entomologia 39(1):13-94. Tindale, N. B. 1923. Review of Australian Mantidae. Records of the South Australian Museum 2:425-457. Wang, T. 1993. Synopsis on the Classification of Mantodea from China. Shanghai Scientific and Technological, Literature Publishing House, Shanghai. The Praying Mantises (Mantodea) of South Africa. Compiled by Alfred P. Kaltenbach, Naturhistorisches Museum in Wien. Checklist of the Mantodea. Los Angeles County Museum. Key to Preying Mantises. David Oliveira. Gottesanbetterinnen. Staatliches Museum für Naturkunde Karlsruhe. Mantodea collection curated by Reinhard Ehrmann. Key to the Mantid Species of Florida (PDF). University of Florida. Visual Prey Recognition in Mantodea. Cornell University. Page: Tree of Life Mantodea. Praying mantids and their relatives. The TEXT of this page is licensed under the Creative Commons Attribution-NonCommercial License - Version 3.0. Note that images and other media featured on this page are each governed by their own license, and they may or may not be available for reuse. Click on an image or a media link to access the media data window, which provides the relevant licensing information. For the general terms and conditions of ToL material reuse and redistribution, please see the Tree of Life Copyright Policies.